When it comes to assignment design, there are some things SAGrader excels at and some things it can’t handle very well. SAGrader can be used in almost any domain, at almost any level, for any length of student writing — from single word responses to 10-page term papers. As I’ve mentioned before, SAGrader assignments can promote learning on many levels, from simple knowledge recall to analysis and evaluation. But here’s the tricky part: Assignment compatibility with SAGrader depends on your assessment criteria. What is it that you’re expecting from students and how will you evaluate their efforts? SAGrader assesses the expression of domain-specific ideas. Sometimes we explain this by saying SAGrader focuses on grading the content of students’ writing. This is true, but it’s important to note that there are (at least) two different methods of grading content. The first is a global assessment of content development and support in a general sense. This is often found in rubrics like the 6-Traits, in a category labeled “Content” or “Ideas”. The criteria is something like: Main idea is clear, supported, and enriched by relevant anecdotes and details. In other words, the grading key doesn’t specify particular concepts that must be explained. Instead it scores students more holistically, based on their focus, development and support of whatever they’re writing about. 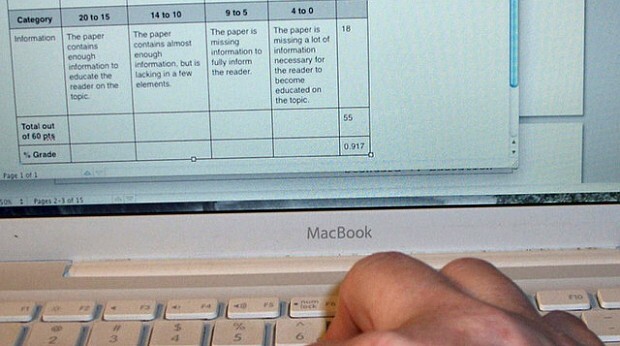 This general rubric can be applied to an assignment on any topic and work the same way. SAGrader cannot handle this type of assessment. The second type of content grading is to check for the adequate expression of content knowledge. This is a point-by-point process that checks for specific ideas or explanations. For example, a very simple assignment about Earth may require students to mention Venus and Mars (nearby planets), Terra (its Latin name), and 23.4° (the tilt of its axis of rotation). The rubric for one assignment can’t be applied to a different assignment because the relevant concepts vary. SAGrader excels at this type of assessment. You can think of it this way: SAGrader needs to know, in advance, what you expect students to write about. Not just the types of information they should include (e.g., a hypothesis, 3 points of support, 1 personal example), but rather the ideas themselves (e.g., Phonology is a subdiscipline of linguistics concerned with the function, behavior and organization of sounds). This means the range of possible responses must be constrained. If students can write about any topic of their choosing, we would have no way of building a comprehensive rubric. And we want students to construct their own answers, rather than selecting from predefined options. So SAGrader aims for the middle ground. Some educators have referred to SAGrader’s sweet spot as intermediate constraint tasks. These questions fall between fully selected responses (i.e., multiple choice) and fully constructed responses (e.g., an essay about your summer vacation). By constraining the range of possible answers to the topics discussed in a particular article, the second option works great with SAGrader. As you can see, there are some assignments that won’t work well in SAGrader. If you want to grade broadly defined essays with no specific content focus, you may need to look elsewhere. In addition, SAGrader probably isn’t your best bet if you’re more interested in writing ability (grammar, spelling, style, etc.) than the demonstration of knowledge through writing. Your assignment will work in SAGrader if you are interested in assessing content knowledge. You should be able to list out — in outline or concept map form — the full range of answers you expect students to submit. If not, talk to us about modifying your assessment criteria or further constraining your answers. Most of this is probably new to you, so please don’t hesitate to get in touch (sales@ideaworks.com) with your questions. We’re always happy to take a look at your assignment ideas and offer our expert advice. If you’d like more examples, download the “Good and Bad SAGrader assignments [PDF]” handout.